One of my best, “go-to” appetizers! Easy to prepare in advance and well-received by guests!! To prepare the marinade: Place parsley, shallots, vinegars, mustard, red pepper, salt, and pepper in the bowl of a food processor. Pulse first to chop things evenly, then purÃ©e. While the machine is running, add the oil in a slow stream. Pour over the shrimp and toss gently. Transfer to a zip-top bag. Refrigerate and marinate several hours or overnight for best flavor. Drain marinade and discard. 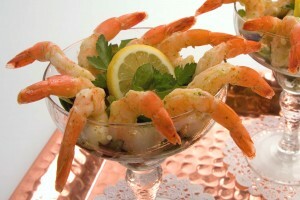 Serve shrimp alone or with canapé toasts as an appetizer, or on leaf lettuce as an elegant first course! NOTE: I prefer to use shrimp in the 16-20/lb size.